Salt and Chocolate: Can you really make Bread in 5 Minutes???? So after hearing all about this Artisan Bread in 5 Minutes a day I figured I might as well buy the book and give it a shot. I will tell you I was more than skeptical about this working. There is a reason that I don’t bake bread, it’s a big time consuming pain. First you have to get the yeast to activate, then you have to let it rise, and punch it down, and let it rise, and then bake it and let it cool and then you can eat it. I just don’t have that kind of patience and normally end up cutting into the bread while its hot and making it look like a mangled mess. So 5 minutes and I would be done I did not believe it. So when the book arrived I immediately read what I needed and started to make the dough as they said. And the dough did come together in 5 minutes no kneading necessary and then it has to sit out on the counter and rise a bit but then you stick it in the fridge and let it sit until you are ready to use it. Then you just pull of a hunk and shape it into a boule and let it rise for 30 minutes and bake. Honest it’s that easy. So while my first loaf was baking, my thoughts again went to skepticism, I bet this bread is going to taste like crap, like cardboard or something, it can’t taste good if it’s made this way. So after my bread cooled (yes I waited) I cut a few slices and gave one to P who was intrigued by this bread that came out of the fridge. And let me tell you……It was good! Like really good, I was in shock. 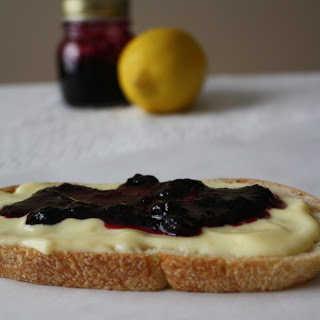 So I slathered some homemade lemon curd and blueberry preserves on it and was in heaven! Now I can’t share the recipe for the bread because that is the whole reason for the book so I would suggest you get it and my next bread to make is the brioche. See I told you it was good! It looks perfect! glad you tried it. 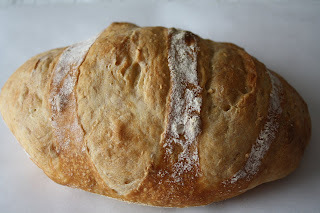 I LOVE this bread/method. So easy and so good! 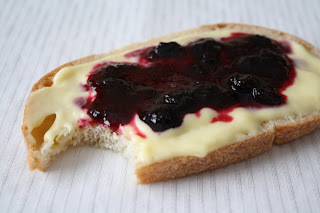 My next loaf I'm slathering in lemon curd and jam! I love this book! I sooo need to get that book!!! I have been wanting to try this bread technique. The no-knead bread recipe has been working so well for me that I haven't been all that motivated to switch! Ooo, I definitely may have to get this! I've seen it all around the blogosphere and everyone seems to love it. I want delicious bread, too! Hi, I just ordered this book because of your recommendation, I live in the mountains, will be interesting to see how this comes out, I'll let you know, now to see if I can find your curd recipe, I LOVE lemon curd! I make a fruit pizza with lemon curd spread over it, YUUUUMMM!! Hi now I have looked and looked on your blog, do you have the recipe for the lemon curd? I would love to try it! Thank you, can't wait to get the book and try the bread, I will let you know how it goes! This method hasn't let me down yet. Great looking bread! Well I MADE IT! WOW! I am at 7000 elevation and have given up baking bread for life until I found your blog and got the inspiration to make this loaf, after getting my mother in laws words about getting her bread at the grocery store, I did it and made it tonight, it was the BEST BREAD my son and husband said they have ever had! YAHOO!!!! Love the book and the recipes, can't wait to make the lemon curd. One piece of advise, wait until the next day to make the bread, I didn't and made it a few hours after and the second loaf came out sooo much better than the first! Thank you and I am a huge fan now! What is the name of the book and where can I get it at?